Lemon essential oil is cold pressed from the peel of a yellow oval fruit, a lemon. It's pale yellow in color. Lemons grow on the Citrus limonium, a small evergreen tree, native to Asia. They presumably first grew in China, India and northern Burma. Now they grow throughout the Mediterranean, Australia, South America and parts of the USA, (California and Florida). 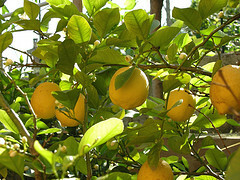 Lemons have a distinct, fresh, invigorating scent with a sour taste. Oil from lemons has health benefits for the body, mind, skin and hair. TIPS: Lemon essential oil blends well with: citrus oils, chamomile, eucalyptus, benzoin, elemi, fennel, geranium, juniper, lavender, neroli, oakmoss, rose, sandalwood and ylang ylang. MAKING SOAP: As with most cold pressed citrus oils, the scent of lemon essential oil does not always stay well in cold process soap. It may not be the best option or first choice in your soap making recipes. Instead, you may want to consider using a lemon verbena or lemongrass oil since these offer a more intense, crisp, citrus, popping, scent. Just a small amount of essential oil is needed in homemade soap recipes. A natural goat milk soap with lemon oil benefits those with acne prone or oily skin. It helps get rid of blackheads and relieve acne. Goat milk has natural vitamins A, B, C, D, E and K! It regenerates collagen under the skin, helps negate the visible signs of aging, keeps skin close to its natural pH level and keeps the skin's acid mantle layer intact. This homemade soap won't strip nutrients from your skin, like most commercial soaps. A homemade soap with lemon oil has a fresh scent. Looking for the right essential or soap making oil? Find, them now! HOMEMADE LOTION TIPS: Lemon helps reduce oily skin conditions. Balances astringent and moisturizing properties. Reduce cellulite. HOMEMADE SHAMPOO TIPS: Lemon is beneficial in a natural shampoo for oily hair. Cleanse hair and get rid of dandruff. Reduce excess oil production of scalp. Wash away dirt, grime and excess oil from hair. Leave hair in healthy, balanced, condition. - If you're pregnant, nursing, taking any medication or have any medical condition, consult your health care provider before using aromatherapy. - Those with an autoimmune disease should avoid since it has immune stimulating properties. - Avoid use during pregnancy. - May cause photosensitivity. This is an enhanced skin reaction due to ultraviolet radiation, (sunlight). It is safe to use but use simple precautions. For example, if you apply lotion to your skin, containing lemon essential oil, avoid sunlight. If you take a bath, with lemon essential oil, take it at night instead of the morning to avoid daytime sunlight to skin. - Essential oils contain bioactive ingredients. This means they contain natural chemicals that interact with biological systems. They're potent chemicals and should be used with care! Never use large amounts of essential oils externally, or internally. Never use them straight. They MUST be diluted in carrier oil, or soap, lotion, or other buffering agent. Never use without knowing what their bioactive compounds can do.